I will admit that I was a bit dubious about this recipe. 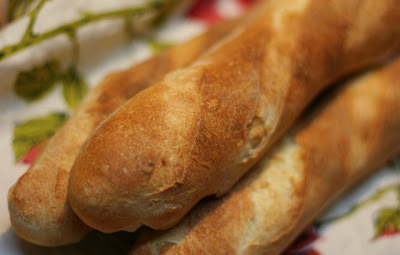 I have made quite a few baguettes in my day, and have even posted a recipe. So how much better could Reinhart's recipe be? The answer: so much better! As with most of his recipes, a little extra time makes for an amazing loaf of bread. The key to this French bread is pate fermente, a dough made the day before and kept in the fridge until needed. This pre-ferment and the final dough is a mix of bread and all purpose flour which makes for a tender loaf with a crispy and crackly crust. I don't have any notes for this recipe, vegan or otherwise.